Musical Canine Freestyle  also known as Musical Freestyle, Freestyle Dance, and Canine Freestyle  is a modern dog sport that is a mixture of obedience, tricks, and dance that allows for creative interaction between dogs and their owners. 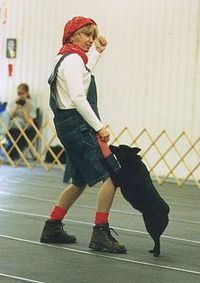 There are two types, Musical Freestyle and Freestyle Heeling (also known as Heelwork to Music), the main difference being that Freestyle Heeling focuses on a dog's ability to stay in variations of the heel position while the handler moves to music, whereas Musical Freestyle demands that the dog perform a variety of tricks and other obedience talents, and places a greater focus on the trainer's dance abilities and creativity. The first musical freestyle group, Musical Canine Sports International, was founded in British Columbia, Canada, in 1991. Soon, other groups in the United States and England followed. Each region began developing its own style, with many American groups promoting more trick-based routines and costumes, and English groups focusing more on heelwork and the dog and less on costumes and design. Musical freestyle is becoming more frequently demonstrated on animal talent shows and as specialty acts as well. Currently, there are several organization regulating competitive freestyle, such as the World Canine Freestyle Organization and Canine Freestyle Federation in North America, and Canine Freestyle GB and Pawfect K9 Freestyle Club (Japan) internationally. Competition rules vary from group to group, and from country to country, but most are based on a variety of technical and artistic merit points. Regardless of the style of routine to be performed, all routines are done free of training aids or leashes (except in some beginner categories). Competition can be done as a single dog-and-handler team, as a pair of dogs and handlers, or as a full team of three or more dogs and their handlers. Generally, for competition, there is one dog to a person. In either type of competition, the choice of music and the way the routine reflects the music is important. Routines that don't seem to follow the pattern of music, no matter how well executed, do not score well. Exhibition freestyle is a no-holds-barred routine designed to demonstrate the full extent of creativity and excitement that Musical freestyle can offer. Though highly entertaining and representing what most people see on television or at events, it allows for moves, props, cues, and costumes that would not always be allowed on the competition circuit. In heelwork to music, the dog and trainer remain close to each other at all times, and sending the dog away or doing distance work is not part of the routine. The dog should appear almost invisibly tethered to his partner, although this is a tether that comes from training and loyalty. Pivots, moving diagonally, backwards, forwards, or back to front are important to the routine, all of course to a suitable musical theme. Jumping, weaving, rolling, passing through the trainer's legs and anything else 'not heeling' is not allowed. 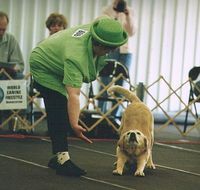 In musical freestyle, heelwork can be combined with other moves such as leg weaving, sending the dog away, moving together at a distance, and more dramatic tricks such as jumps, spins, bows, rolling over, dancing in place, and other innovative actions where the dog plays off of the dance moves of their partner are encouraged. A popular finishing trick for some routines is to have a smaller dog jump into the trainer's arms or over his or her back. In the UK, there are 4 stages of competition. Starters, Novice, Intermediate and Advanced and they often have special classes such as Juniors and Pairs or groups, often to a selected theme. The marking is based on Technical Merit and Artistic Interpretation. These categories are worth 10 marks each. Many people are surprised to learn that you do not need to know how to dance, to dance with your dog. Moving together in a simple routine to music is a great way to put obedience training in action and keep dogs entertained and interested in learning. Teaching a dog to be able to work on both sides of the handler's body, not just the left side as in standard obedience heeling, is the first step to doing freestyle. Simple moves like teaching the dog to back up as the handler moves forward, to turn in place and to move sideways with the handler are the foundation of any freestyle routine. The trainer selects a short musical piece, a minute or two, that reflects the dog's attitude and pace in doing his moves (some dogs do better with a waltz, others suit rock and roll boogie), and decides what moves would go best with the music. To start with, the trainer breaks the routine into pieces with only two or three moves linked together, and the trainer and dog work harder, these pieces are linked together. The goal is to have fun; a handler or dog becoming stressed indicates that it's time to take a break. The most important thing is that dog and human get to spend time together, not that the dog can do tricks for friends. This article is licensed under the GNU Free Documentation License. It uses material from the Wikipedia article "Muscial Canine Freestyle".